Can Liberia Ditch Foreign Aid by 2022? 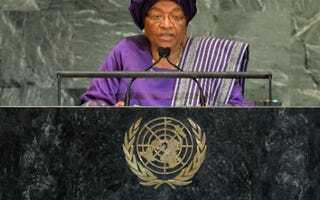 (The Root) — Liberian President Ellen Johnson Sirleaf has a vision for her country: to be off foreign aid in 10 years and "middle income" by 2030. She also sees a role for African Americans, to whom her people are linked by a shared history, in that vision. Africa's first elected female head of state closed out her address to the United Nations General Assembly on Wednesday by assuring those gathered: "Despite the distractions, local and external, our people are determined to take their destiny into their own hands." On Thursday Sirleaf also told a forum of future leaders at Columbia University, "We are determined that in 10 years, Liberia will not have to take foreign aid, that we can do it on the basis of our resources. We are determined, when I talk about a 2030 Vision, that come the year 2030, we will be a middle-income country." Given that Liberia is one of the poorest countries in the world, according to data from the International Monetary Fund World Economic Outlook, it's an ambitious plan. The IMF reports, however, that the percentage of people living on less than $1 a day has declined from 64 percent in 2007 to 56 percent in 2011. Liberia's National Vision 2030 plan, launched earlier this year, replaces the previous poverty-reduction strategy, Lift Liberia, and gives the people of Liberia a chance to take part in the national rebuilding process. But getting off foreign aid will not be easy. Historically the country has relied on it. In 2008, when Lift Liberia began, foreign aid to the country represented 771 percent of government spending, according to the Financial Times, which did an analysis of African countries. In addition, U.S. aid to the country increased from 2010 to 2011. But the IMF just reported, "Liberia's economic growth is on an upward trajectory and economic prospects over the medium term remain favorable. Real GDP growth is expected to reach close to 9 percent in 2012, driven by continued strong growth in the mining sector and rising activity in construction and other services." Liberia is a country rich in natural resources — including iron ore, rubber, timber, diamonds, gold and tin — which Sirleaf, a former banker, is relying on to help the economy. The nation is also prospecting for oil. "We won't see a drop of oil in my administration, thank God, so I won't have to deal with that," she said, which elicited a laugh from the Columbia audience. Then she added, "But if we do not take the measures which protect future generations, then we stand a chance that Liberia, too, becomes a nation with a resource curse [as is the case in some poor nations]." To that end, she is trying to ensure that systems are in place so that any oil wealth goes back to the country and its people. The president, now in her second term, also has a vision for educating her country, a key factor in lifting it to middle-income status. Sirleaf, who studied economics and public policy at Harvard's John F. Kennedy School of Government, is passionate about giving girls and women in her country the opportunity to attend school. "It's one of my top priorities," she told the audience at Columbia. So far her efforts are paying off. While in New York, Sirleaf received an award from the Africa-America Institute for improving literacy in her country. The Sirleaf Market Women's Fund was specifically set up to provide women who work in the markets with business, accounting and literacy skills. Sirleaf points out that the challenge Liberia faces, along with many other countries in the region, is moving from a failed state to a fragile state to a competitive state. The failed state stems from 14 years of brutal civil war, which ended in 2003, but the Nobel Peace Prize laureate told the General Assembly that the country is past that period, even though 7,000 U.N. peacekeepers remain there. "Liberia is no longer a place of conflict, war and deprivation. We are no longer the country our citizens fled, our international partners pitied and our neighbors feared," she said in her address. She is asking for help for her fragile state. At a Sunday stop at Abyssinian Baptist Church in New York's Harlem community, the card-carrying member of Alpha Kappa Alpha Sorority reminded congregants of the roots of her country, which was colonized by freed slaves from the U.S. The Liberian president also encouraged African Americans to aid her country in a way that has less to do with money and more with power. "What can African Americans do for Liberia?" she asked the congregation at the historic black church. "You can be our ambassadors; you can be our advocates. The Jews in this country do it for Israel. Why can't you do it for us?"